Functions: To promote sweating and bring the rash to the surface. Indications & Combinations: Early stage of measles due to attack of wind and cold manifested as fever, no sweating and measles without a rash. 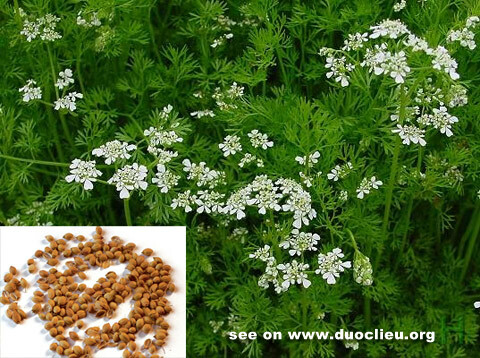 Coriander (Husui) is used with Spirodela (Fuping) and Cimicifuga rhizome (Shengma). The heated herbal tea is applied to the skin to bring the rash to the surface. Cautions & Contraindications: The herb is contraindicated in measles without a rash on the surface due to excessive toxic heat in the interior.